With American Thanksgiving and Christmas rapidly approaching, the pie baking season is rapidly approaching. One of the most important, but least quantified, aspects of pie creation is the crustal composition. 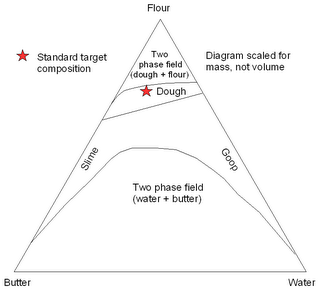 A simple ternary phase diagram for three-phase pie crust is presented below. While the “traditional composition” point is plotted to scale, the positions and shapes of the curve are poorly constrained approximations. Lack of accurate thermodynamic data for the system precludes accurate prediction of these fields. It is the shapes and positions of the top two curves that is of paramount importance; anyone who reaches the butter-water two phase field should be banished from the kitchen. As anyone with baking experience knows, the stability region for pie crust is a relatively small area on the wet side of the two phase flour + dough field. 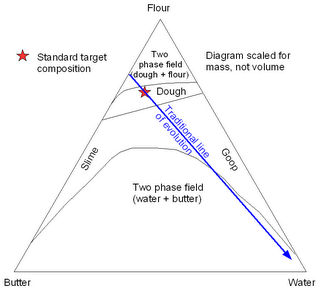 This field is generally approached by adding water to a flour/butter mixture, as is shown below. However, if the approximated slopes shown above are correct, then a radical new approach to crustal formation might be advisable. 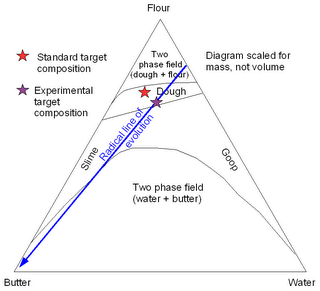 By generating a flour-water mixture, and then adding butter, a wider range of valid crustal compositions should be achievable before exiting the edible portion of this phase diagram. This approach is shown below. In hindsight, this was silly. There are two reasons. Firstly, accurately ganguing the initial water/flour mixture is difficult, as your starting composition is in the 2 phase flour water field. And secondly, this procedure generates a crust with the minimum possible butter, and butter is yummy. So this year, I will endeavor to explore the left hand side of the diagram. I suspect that the dough / slime boundary curves over a bi farther than is illustrated here. It's cute how you can use phases to describe combinations of ingredients. But how would you describe, for example, lumpy gravy? Lumpy gravy has the same ingredient proportions as smooth gravy, but the mechanical properties of the lumps make it difficult to mix. Likewise, as you follow a trajectory through the ingredient triangle, you may find yourself making lumps of some sort. The same point, approached from different trajectories, may be either lumpy or smooth. I'm curious whether you can diagram such a thing. If not, your approach may not be able to avoid it in practice. But just in case you dodge that bullet: Your triangle would suggest that the best thing to do is start with two mixtures: one of about 50/50 flour/butter (which you can make with a standard pastry cutter) and the other of about 80/20 flour/water. Then add the flour/water mixture bit by bit to the flour/butter mixture until a dough forms. In fact, it's better than that. The flour/water mixture can be optimized for this purpose by adding water slowly to flour until it leaves the two-phase state. The flour/butter mixture can be optimized by adding flour to butter until it stops being slimy. Then, just about any mixture of the two mixtures should produce a usable dough... as long as the lines of the dough region are not inflected inward too sharply. Lumps are not an equilibrium condition, so cannot be described by equilibria diagrams. If lumps are not an equilibrium condition, and we are advised to "keep stirring"... I fear you'll never have a flaky crust! Lumps of butter are a feature, not a bug, in the final desired consistency of dough. Overworking dough ruins it (assuming you want flakiness). If you can explain the physical analysis of this phenomenon, I would love to hear it--not my area of science, but I am a huge fan of pie! Something that hurts flakiness is overdevelopment of gluten. That happens from stirring. It's why bread needs to be kneaded - to make it more glutinous. Something that helps flakiness is having layers of butter in between layers of flour. It's why croissants are rolled out several times - to spread out the lumps into layers. I agree that "keep stirring" is not always good advice in far-from-equilibrium systems like cooking. In addition, it's not good advice in far-from-equilibrium systems like frustrated cooks who are trying to deal with lumpy gravy.